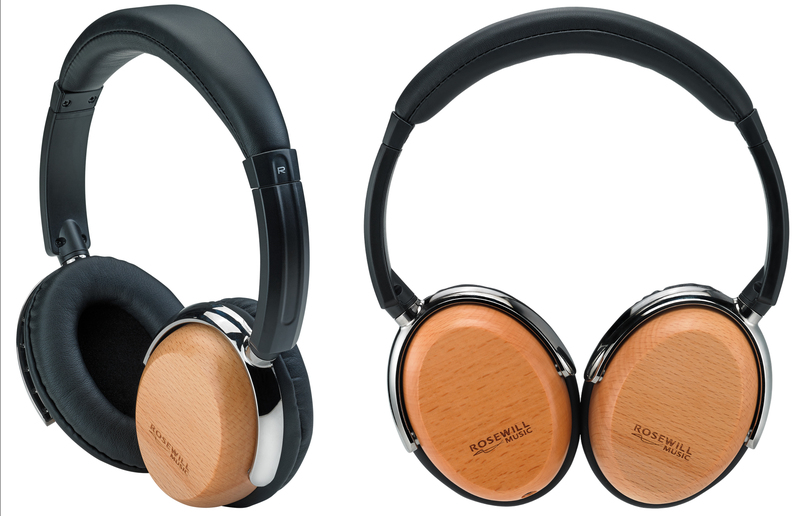 These headphones are made with beautiful beechwood, but does the sound quality match the aesthetics? An attractive design incorporating beautiful beechwood with fairly comfortable earcups. The headband is a bit tight and the sound quality leaves a bit to be desired. While the sound isn't perfect, it also isn't enough to dismiss the Prelude headphones. The price is enough to consider these attractive looking headphones. The most remarkable aspect of the Prelude Design is the earcups. They are made with genuine beechwood, which gives each pair a unique and classy look. The wood is beautifully polished to a shine with the Rosewill Music logo laser etched on each side. Normally, a logo so prominently placed would look tacky, but it naturally blends into the design of the wood. A nice added design feature is the angled headband. While it might cause some trouble at first, because it doesn't initially feel natural, it is much appreciated for me. While a normal band goes straight up and over the head, this band sits forward, meaning it avoids the top of my hat without sitting strangely on my ears. The cable that comes with the Prelude headphones is also a nice choice. Most headphones in this price category come with a standard 1/8" cable, but the Prelude headphones come with a braided fabric cable instead. This cable also has inline microphone and audio controls, compatible with many smartphones and media players. The rest of the design, however, leaves a little to be desired. While the cups look classy, the rest is made of plastic and vinyl. The chrome look of the clasps adds a nice touch, but would have been better served with an actual aluminum, rather than metallic looking metal. The top could have maintained the classy look generated by the cups by using leather rather than vinyl. The swivel feature on the cups is a nice, and unexpected touch, especially for the price. The feature is popular among DJs and live audio engineers, who need to be able to hear audio from their headphones as well as the room they are in. The angled band, however, makes this a little more awkward than normal DJ-style headphones. The Sound Quality of the Prelude headphones is not going to set the world on fire, but you are likely not going to be upset about owning them, either. Upon first listening, the most obvious aspect of the audio is the bass. These headphones are tuned such that bass will definitely overshadow the rest of the audio experience. Rosewill is far from the first company to tune for bass, especially in this class of headphones, so it was not exactly a surprise. The speakers used within the headphones, however, are not particularly bass responsive, so you end up with a bit of a muffled sound. The Sound Quality is not going to ruin your listening experience. In fact, the sound is reminiscent of what you would get from a waterproof speaker. With something waterproof, though, you expect to tradeoff a little fidelity for the benefit of being able to withstand the water. In this case, the loss of fidelity has no direct tradeoff. When you put the Prelude headphones on, the first thing you will notice is that the headband is not mounted at 90 degrees to the earcups. Instead, there is a slight angle that, if worn correctly, puts the band further forward on your head. This will avoid the center of a baseball cap or a headband, making it more comfortable to wear. It will also make putting them on the first time a little awkward. After getting past the band, these headphones are fairly comfortable, assuming you like an over-the-ear headset. The material on the earcups is soft and the padding has a nice give to it. Unfortunately, the band itself is a little tight, and a little extra pressure is put on the ears. If you are wearing the headphones for a shorter period of time, less than 2 hours, this will probably not become a big problem. If you wear them for longer, though, your ears are likely to start hurting. Though we did not have the ability to long-term stress test the Prelude headphones, we can make a few predictions about how they will wear with time. The two major factors that weigh into their comfort are likely to switch places. The headband will inevitably loosen up, making longer listening periods more comfortable. The earcup pads, however, will likely lose their covering, making them less comfortable to wear in general. The earcup issue isn't unique to the Prelude headphones, so it is not a limiting factor for purchase. Physically, the Prelude headphones appear to be put together well. The vinyl across the band is stitched internally, preventing wear on the seam itself. The adjustable aspect of the band is tight, so there isn't concern about the headphones slipping while you wear them. While the general build is good, there are some places where a little extra care could have been taken. In looking at the headphones, there are 8 screw heads visible. Matching caps to cover those screws would have been a nice touch. In addition to exposed screws, the wires that connect the speakers are visible where they run through a hollow channel in the clasps. Closing that channel, rather than leaving it open, would have also maintained the classic styling presented by the beechwood.